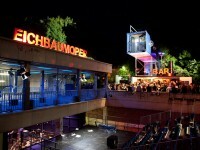 Eichbaumoper characterises the temporary transformation of the metro station Eichbaum into an opera house. ‚Eichbaum’ is a crosspoint and station located between the cities of Essen and Mülheim. Located in the eye of the highway intersection between the motorway A40 and the B1, this station was built using a lot of concrete in the 70’s as a fit for the future infrastructure project. Once considered as a place of aspiration and hope, the ‚Eichbaum’ is now shaped by vandalism, fear and foreboding. However, ‚Eichbaum’ is an important connection in an urban landscape that is dissected by highways and metro lines. At the same time, the site can be viewed as a model for the current situation of this former industrial region, facing urban and social challenges. The place with its conditions was to become the starting point for contents and topics of the new opera. The newly built „Opernbauhütte“, on the square that was once a small market for potato farmers and the ‚egg granny’, stands out as an architectural symbol of reactivation and transformation and offers workshop space, conference room, bar, cinema, art gallery, meeting place, reading café, etc. The invited composers, librettists and local residents formed the opera. Their fears, hopes, dreams and memories went directly into the librettos, real world of everyday life started to merge with the artificial world of opera. In addition to the local peoples stories, the noise of the highway, the rhythm of the passing metro and the inhospitable spaces became the formative part of the „Eichbaumoper“, which performed in June and July 2009 in the grounds of our temporary opera house. Theatrical and urban spaces are no longer separated from each other. The „Eichbaumoper“, constructed from a neglected station became a theater in which there were no spectators, only actors and in addition to the artistic enjoyment of the spectacular moments of the newly formed Opera, a process of change was activated, which persists until today.